In feng shui, lucky bamboo is ideal when it’s straight. Sometimes you see the curly or twisted versions, which actually represent the opposite of upright and positive growth, such as spinning and downward spiraling energy. I love using lucky bamboo for feng shui applications because they can thrive in a variety of lighting conditions, in water or in soil, and are easy to find. I often suggest clients place two lucky bamboo stalks in a single vase of water in the relationship area of their bedroom. To locate this area, stand at your bedroom door facing into the room. The far back corner to the right is the relationship area. The pair symbolizes a harmonious union between you and your current or future partner. Both stalks are best similar in size as they also represent a balanced and equal relationship that can grow together in accord. If you’re looking for more abundance and prosperity, you can place 3 or 9 stalks in the wealth area of your home, office, or bedroom—or better yet, in all three locations. To locate the wealth area of the feng shui map, stand in the entry door to the home or room. The far back corner on the left side represents wealth, prosperity and abundance. The bamboo will represent positive and steady growth. Orchids are graceful flowering plants. The flowers are long lasting and come in a variety of shapes, sizes, and colors. They can bloom all year round, even in the coldest winter. Orchids not only absorb carbon dioxide but they release oxygen at night, which make them ideal for bedrooms. They can also help us sleep better because of this fact. But there’s another reason why they are excellent to place in the bedroom. For feng shui purposes, we often use orchids for relationship adjustments. While the bamboo can be used for a current or prospective relationship, the orchid is more often used to find a new partner. An orchid placed strategically in the relationship area of the bedroom or on your nightstand will help to attract an honorable and honest romantic partner. It makes me very sad when people toss orchid plants after the flowers have wilted. What most people don’t know is that after the flowers die, the remaining plant is still alive! The plant is in a dormant stage so it may not flower for some time, but you can keep it just like a regular plant. It’s such a reward to see my orchids bloom every year. I have a Golden Pothos that I received as a housewarming gift over a decade ago. This green plant is a vine with heart shaped leaves. This plant is suitable for those with the blackest of thumbs. My plant has survived weeks of forgetful watering and even a dark ground floor apartment. They’re also very insect resistant. The Goldon Pothos is said to be particularly good for removing formaldehyde and carbon monoxide. I like to recommend this to plant to the houseplant novice. It’s great for dead corners and areas above cabinets or shelves. In feng shui, these types of locations in your home attract and easily collect stagnant and dead energy. Because the Golden Pothos is easy to care for and low light, it’s perfect in these places. The plant will stay green, can be slightly neglected but still bring life energy to that area. The best part about the Golden Pothos is that it is incredibly easy to propagate. Simply cut off a 3″ or longer piece, just below a leaf or a node (or joint). The cuttings can be placed in water. The roots will start growing in a couple of weeks, then you can transfer the new plants into a pot with soil. As a rule of (green!) thumb, in feng shui we generally prefer plants with soft and rounded leaves. This shape offers a softer and gentler energy. Plants with sharp leaves, thorns, or spiky needles are best avoided for feng shui applications. That said, there are absolutely situations that they may be appropriate for. And if you already have such plants in your home this does not mean you need to remove them. For example, maybe you have a great attachment to a cactus that you received from your grandmother years ago. But in general if you want to add a plant into your home with a feng shui intention, go for something less prickly. A reminder, please be mindful of the plant’s health. If it’s not doing so well, do your best to revive it. People often overwater. To avoid this scenario, I suggest you use your finger and feel how moist the soil is. Just poke it in the top about 1-2 inches. Don’t be afraid to get your hands dirty! Houseplants also add natural beauty to your home, offer positive wood energy, and improve your air quality. Now get out to your local nursery, pick up a houseplant that’s appropriate for how much light you have in your home, and get your hands in some compost and dirt! Bamboo is a plant that is abundant in Asia and grows very quickly. It represents upright and honest growth, as well as flexibility and adaptability. Since the bamboo plant does not flower or fruit, it’s lifespan is long and simple. And because it is hollow, bamboo also symbolizes an empty heart of humbleness. I love the fact that in western culture, lucky bamboo has also become a symbol for the green sustainability movement. Lucky bamboo is not technically bamboo, but it looks very similar, is super easy to take care of, and represents the same thing symbolically. In feng shui, lucky bamboo is ideal when it’s straight. Sometimes you see the curly or twisted versions, which actually represent the opposite of upright and positive growth, such as spinning and downward spiraling energy. 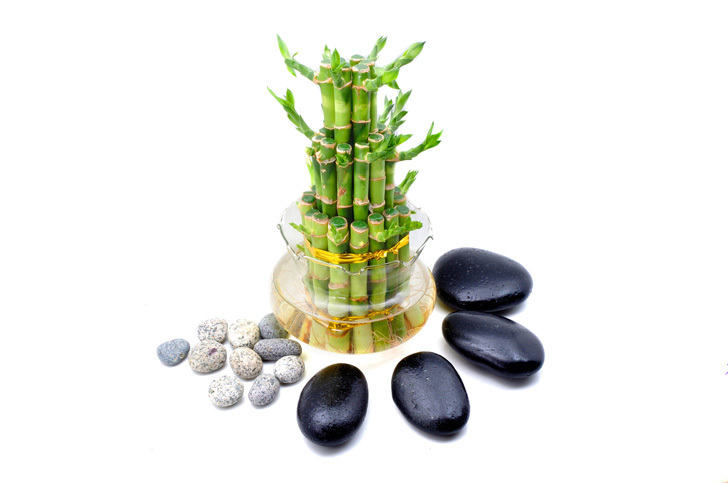 I love using lucky bamboo for feng shui applications because they can thrive in a variety of lighting conditions, in water or in soil, and are easy to find. 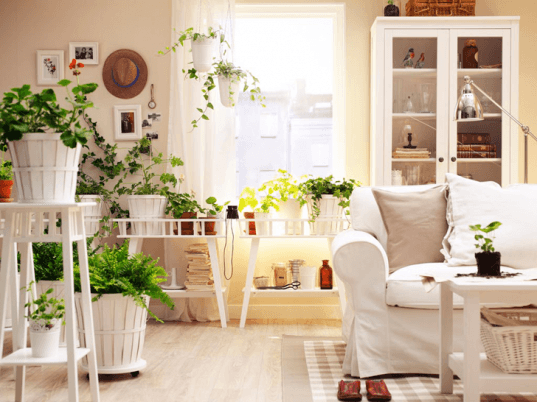 RELATED: 5 Ways To Kick Off Your Green Spring Cleaning With Feng Shui Principles I often suggest clients place two lucky bamboo stalks in a single vase of water in the relationship area of their bedroom. To locate this area, stand at your bedroom door facing into the room. The far back corner to the right is the relationship area. The pair symbolizes a harmonious union between you and your current or future partner. Both stalks are best similar in size as they also represent a balanced and equal relationship that can grow together in accord. If you’re looking for more abundance and prosperity, you can place 3 or 9 stalks in the wealth area of your home, office, or bedroom—or better yet, in all three locations. To locate the wealth area of the feng shui map, stand in the entry door to the home or room. The far back corner on the left side represents wealth, prosperity and abundance. The bamboo will represent positive and steady growth. Orchids are graceful flowering plants. The flowers are long lasting and come in a variety of shapes, sizes, and colors. They can bloom all year round, even in the coldest winter. Orchids not only absorb carbon dioxide but they release oxygen at night, which make them ideal for bedrooms. They can also help us sleep better because of this fact. But there’s another reason why they are excellent to place in the bedroom. For feng shui purposes, we often use orchids for relationship adjustments. While the bamboo can be used for a current or prospective relationship, the orchid is more often used to find a new partner. 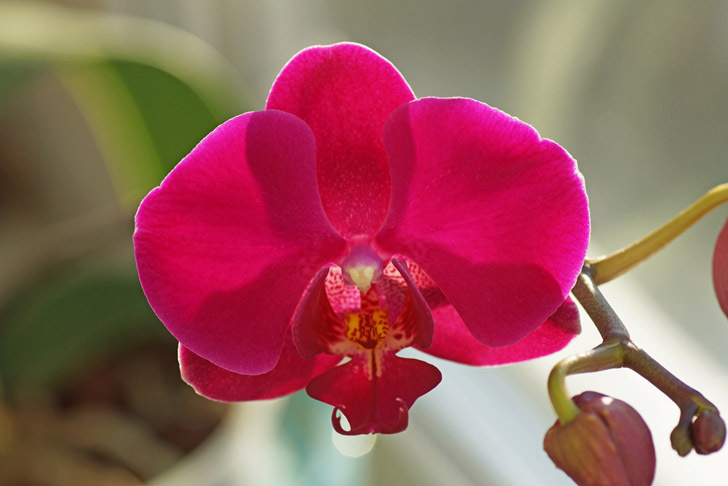 An orchid placed strategically in the relationship area of the bedroom or on your nightstand will help to attract an honorable and honest romantic partner. It makes me very sad when people toss orchid plants after the flowers have wilted. What most people don't know is that after the flowers die, the remaining plant is still alive! The plant is in a dormant stage so it may not flower for some time, but you can keep it just like a regular plant. It's such a reward to see my orchids bloom every year. I have a Golden Pothos that I received as a housewarming gift over a decade ago. This green plant is a vine with heart shaped leaves. This plant is suitable for those with the blackest of thumbs. My plant has survived weeks of forgetful watering and even a dark ground floor apartment. They’re also very insect resistant. 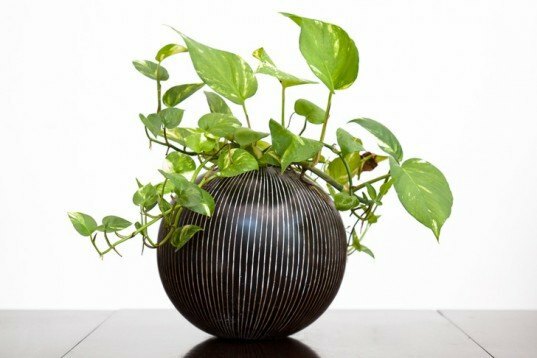 RELATED: FENG SHUI 101: Getting Started with the Basics The Goldon Pothos is said to be particularly good for removing formaldehyde and carbon monoxide. I like to recommend this to plant to the houseplant novice. It’s great for dead corners and areas above cabinets or shelves. In feng shui, these types of locations in your home attract and easily collect stagnant and dead energy. Because the Golden Pothos is easy to care for and low light, it’s perfect in these places. The plant will stay green, can be slightly neglected but still bring life energy to that area. The best part about the Golden Pothos is that it is incredibly easy to propagate. Simply cut off a 3" or longer piece, just below a leaf or a node (or joint). The cuttings can be placed in water. The roots will start growing in a couple of weeks, then you can transfer the new plants into a pot with soil. As a rule of (green!) thumb, in feng shui we generally prefer plants with soft and rounded leaves. This shape offers a softer and gentler energy. Plants with sharp leaves, thorns, or spiky needles are best avoided for feng shui applications. That said, there are absolutely situations that they may be appropriate for. And if you already have such plants in your home this does not mean you need to remove them. For example, maybe you have a great attachment to a cactus that you received from your grandmother years ago. But in general if you want to add a plant into your home with a feng shui intention, go for something less prickly. A reminder, please be mindful of the plant’s health. If it’s not doing so well, do your best to revive it. People often overwater. To avoid this scenario, I suggest you use your finger and feel how moist the soil is. Just poke it in the top about 1-2 inches. Don’t be afraid to get your hands dirty! 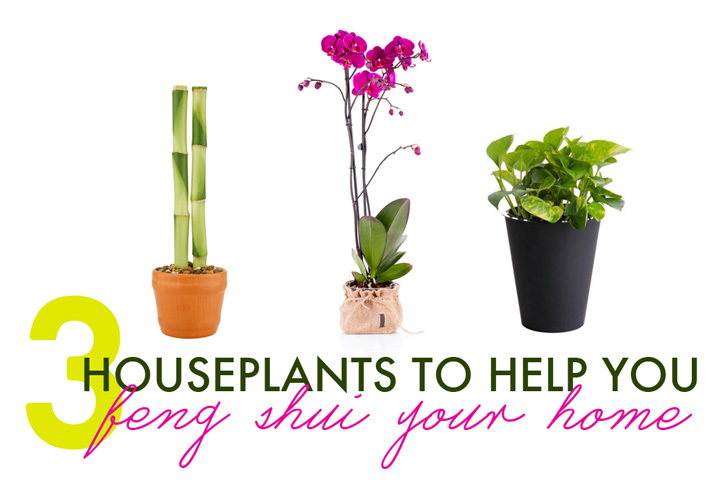 Houseplants also add natural beauty to your home, offer positive wood energy, and improve your air quality. Now get out to your local nursery, pick up a houseplant that’s appropriate for how much light you have in your home, and get your hands in some compost and dirt!